The Publix Supermarket on South Cobb Drive at Cobb Center is expected to close in before theend of the year. While not publicized at the time, the new Publix currently under construction at Jonquil (Atlanta and Spring Roads) is a replacement of, rather than in addition to, the existing Cobb Center store. The two stores are about three miles apart. 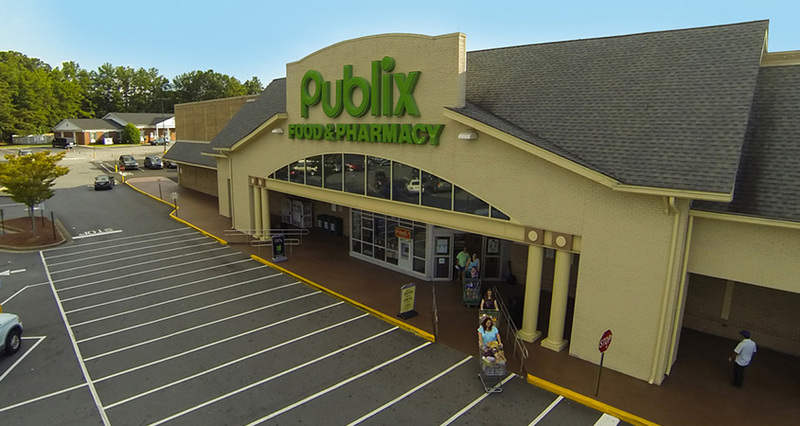 At just over 56,000 square feet, the Cobb Center store is over 10,000 feet larger than upcoming Jonquil Plaza Publix. It's interesting to see Publix reducing the size of its stores at a time when rival Kroger is opening more and more mega and "Marketplace" stores that push 110,000+ square feet. About two miles south of Cobb Center, Kroger opened a new 93,000 square foot store in early 2012. The new store replaced an older, 42,000 square foot "greenhouse" Kroger across the street. The Cobb Center store opened 1996 at which time a 20 year lease was signed. The lease is due to expire 12/31/16 which seems to suggest this might have been planned since the time of the Jonquil announcement, just not publicized. The new store, previously thought to be opening in spring 2017, is now on track for an early-to-mid December opening. Sources close to the company indicate that the plan is for the Cobb Center store to close one day, and for the Jonquil Plaza store to open the following day. Interestingly, Brenda Reid, Atlanta's Media & Community Relations Manager for Publix Super Markets, said at the time of the Jonquil store announcement that the Publix at Jonquil will be the company’s third store in Smyrna. “We look forward to opening our third store in Smyrna and providing the Publix shopping experience at this new location.” Following the Cobb Center closure, and Jonquil opening, the company will operate a total of two stores in Smyrna, the second being at South Cobb Drive & the East West Connector in Highland Station shopping center. 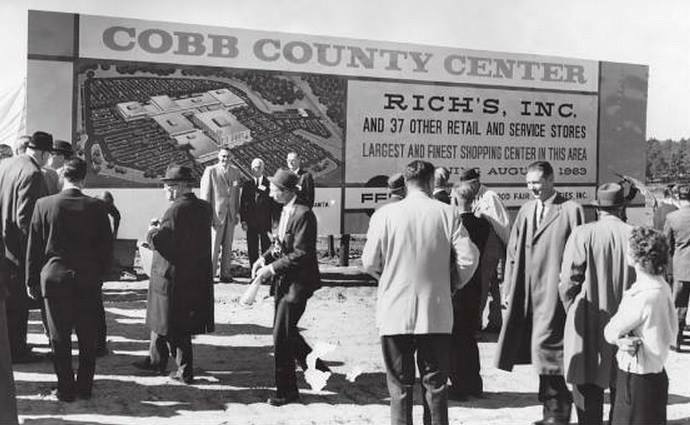 Cobb Center, previously known as Cobb Center Mall, Four Seasons and originally Cobb County Shopping Center, opened in its original form August 15th, 1963 and was home to the fourth Rich's store. In it's early years, the Cobb Center Rich's was hugely successful With mounting competition (Cumberland Mall  and Town Center Mall  ) years of decline and changing demographics, the property was mostly demolished in 1995, except for the Rich's(then operating as Rich's-Macy's) which stayed open until their 2004 closure. According to an "Offering Memorandum" from El Segundo, California-based Matthews Retail Advisors, the 21 acre property is being marketed for sale for about $8.5 million. The offering, which seems to have been completed earlier this year, indicates that the property is a "100% leased grocery-anchored shopping center with daily needs co-tenancy." Jonquil Plaza, which also opened in 1963, also fell on hard times in its later years and was demolished and is being rebuilt for what is today known as simply, Jonquil. Atlanta-based Halpern Enterprises is redeveloping Jonquil Plaza as well as nearby Belmont Hills Center, originally built in 1954, and today known as simply Belmont. Are you surprised to see Publix closing their South Cobb Drive location? What would you like to see happen to the Cobb Center property? Are you pleased to see the results of the Belmont redevelopment start to take shape with Jonquil due for completion soon? Not surprised at all. That center has seen better days. Also not everyone wants or needs 80,000 square foot or larger grocery stores. Like shopping at Wal Mart which I detest. My little Publix near me carries everything that I need. In and out fast. They've got a small window to hit in Early December as Publix traditionally won't open a new store the week of Thanksgiving and from 12/18 - 1/7. The really don't like stressing the new store over the holidays, but maybe the whole staff is relocating so it won't be as bad of an ordeal. Any insight to the other tenants going in Jonquil?